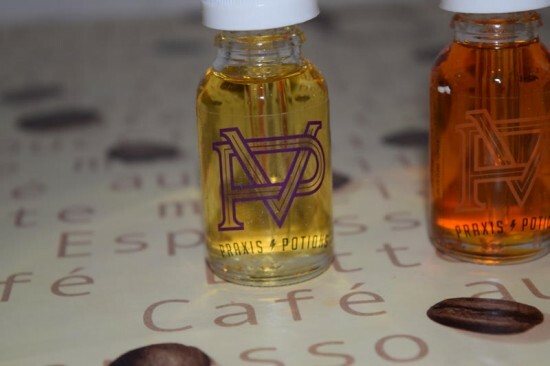 Praxis Potions is a line of e-liquid created by the guys at Praxis Vapors, a California-based company better known for their high-quality hardware. If you have any experience with RDAs and advanced mods, you’re probably already familiar with the Praxis brand. They are the guys behind the Derringer, a popular RDA famous not only for its tiny size, but also for its impressive performance, both in terms of flavor and vapor production. 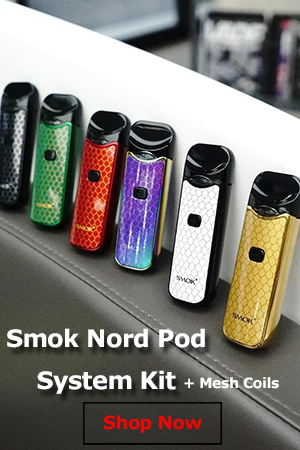 They have since built a reputation for offering high-end vaping gear, including mechanical and regulated mods. 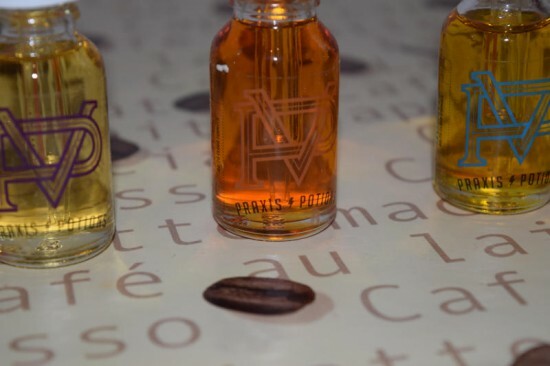 After their continued success in the hardware business, Praxis apparently decided to try their luck with premium e-liquids, launching the Praxis Potions line which currently consists of three original flavors named after semi-precious stones – Amethyst, Amber and Quartz. 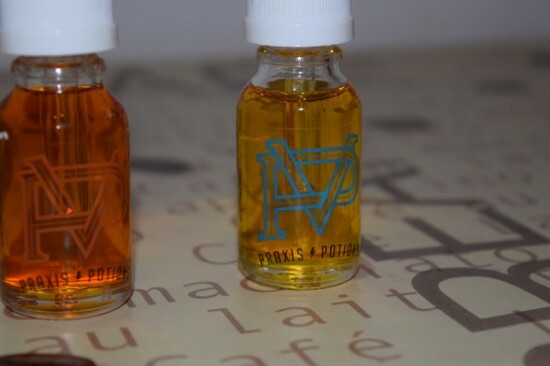 Praxis Potions juices are all 80VG/20VG and come in four nicotine strengths – 0,3,6 and 9 mg/ml. 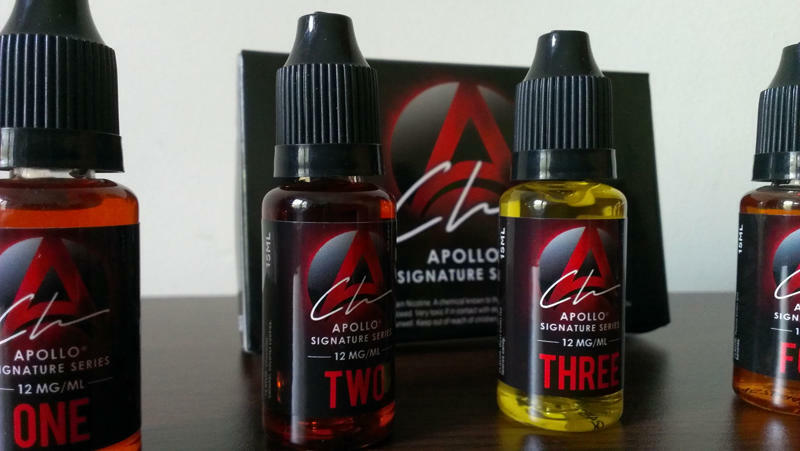 You can opt for 15 ml, 30 ml or 120 ml bottles, priced at $12.99, $22.99 and $74.99 respectively. I bought all three flavors in 15 ml bottles, which are clear glass with dropper caps and feature all the necessary warnings, ingredients and a batch number on the bottom. The design of the labeling is also pretty nice, with a Praxis Potions logo on the front color-coded to match the stone after which the e-liquid is named. So Quartz is blue, Amber is amber and Amethyst is purple. Amethyst – According to the description on the Praxis website, this clear e-liquid is a “full-bodied yogurt base infused with an explosion of rich fruity flavors.” I imagined Amethyst would taste similar to the fruity flavors of yogurt-themed e-liquid The Schwartz, but after taking a whiff of the bottle, I realized it would be very different. While those were berry infused, this had a very strong citrus smell. Nothing wrong with that, as far as I’m concerned, I love a nice refreshing citrus as long as it’s well made. The weird thing was that the yogurt was so discrete my senses struggled to detect it among all the strong fruity aromas. It’s definitely there, but it’s just not as strong as I imagined a yogurt e-liquid to be. That said, Amethyst is definitely an enjoyable vape if you like fruit flavors, especially citrus ones like lime and lemon. Apart from being confused by the official description, there is nothing negative I can say about this juice. 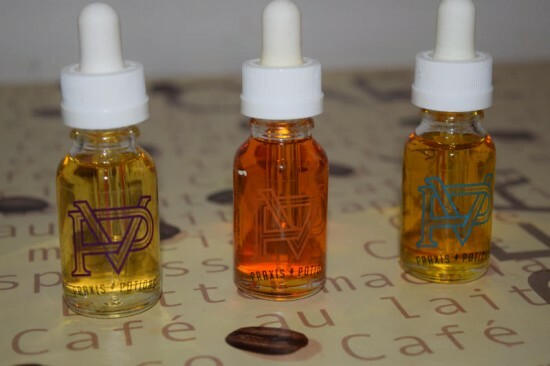 Amber – I’m vaping this juice as I’m writing this review and man does it taste delicious! 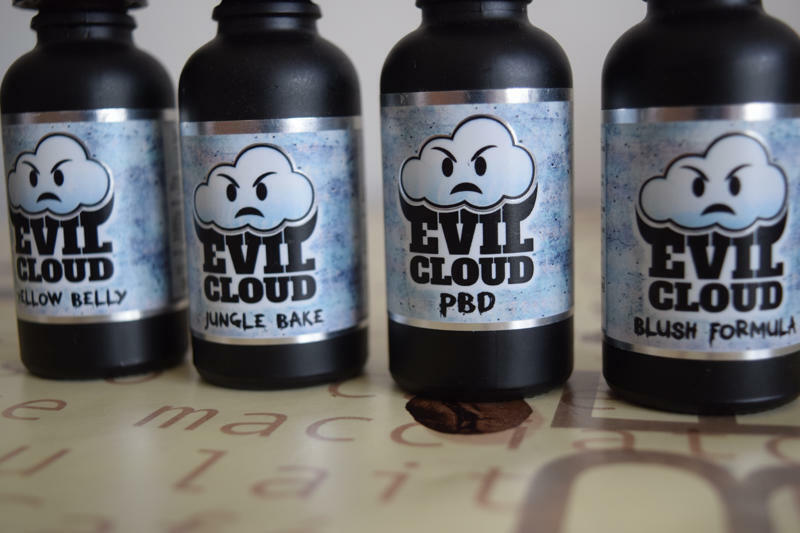 It’s without a doubt one of the best sweet vapes I’ve ever tried and there have been a few. Amber is described as a “light crispy wafer filled with rich creamy peanut butter and light fluffy cream.” And believe me, it tastes as good as that sounds. To be honest, I don’t really get that authentic peanut butter taste while vaping this, but rather a nice walnut and cream filling which works great with the spot-on wafer. The after-taste I get from this masterpiece of a blend is just divine as well – my mouth is left tasting like I just had a sweet wafer, which is mind-blowing. 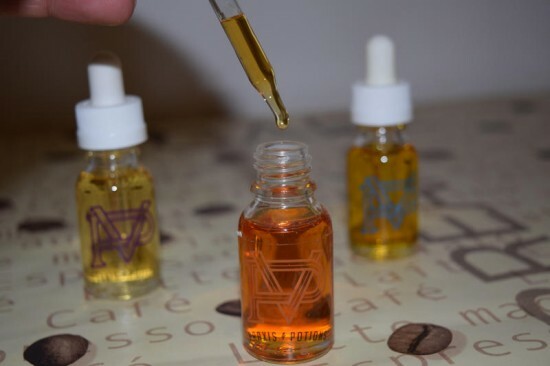 One thing to keep in mind though is that Amber is very sweet, almost nauseatingly so, so if you’re not too big on sweet nutty flavors, you’re probably not going to love this juice as much as I do. Quartz – This third and last Praxis Potions e-liquid is the company’s “take on rainbow sherbet, a blend with citrus and raspberry notes.” Sadly, I’ve never had the chance to try rainbow sherbet before, So I can’t say if they managed to nail the flavor, but I will say that Quartz is a delicious and refreshing vape. The raspberry is clearly the strongest flavor in this fruit blend, but I also get clear notes of citrus like lime, orange and even kiwi on the exhale, although I’m not positive about that last one. It has some sweetness to it as well, but just enough to make the juice more enjoyable. Quartz is a complex fruit vape that while putting the raspberry center stage, manages to bring out all the other flavors as well. If I were to pick a winner from the three, it would have to be Amber, simply because I’ve never tasted a more realistic wafer e-liquid before. However, Quartz and Amethyst are also very tasty e-liquids, and I would wholeheartedly recommend you give them a try if you get a chance. 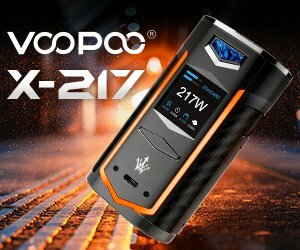 To really bring out the awesome flavors of Praxis Potions, I would suggest you vape them in good RDA. Tanks work too if you’re not comfortable building your own coils, but flavor wise, there is nothing like dripping.